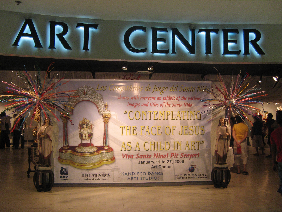 There is this exhibit on the Santo Niño with the theme: “Contemplating the face of Jesus as a child in art”, at the 3rd floor Art Center near VECO SM City Cebu. It is free and you only have to sign in the registration area. 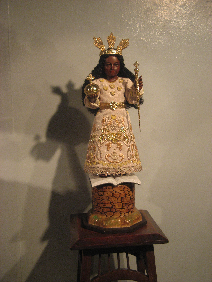 Displayed there were the many different statues (Small and Big), some paintings of the Santo Niño coming from different areas and titles. In order to fully enjoy and understand the Sinulog Celebration one must understand its religious roots and this is definitely a must see both for foreigners and locals alike. I went there last Sunday and it took sometime to research and organize the content and photos. 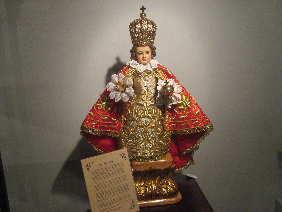 Santo Niño de Navidad (Holy Child of Christmas), Santo Niño de Alegre (Hapy Holy Child), Santo Niño delos Carpenteros (Holy Child of the Carpenters), Santo Niño del Remedio, Madrid España (Holy Child of the Remedy, Madrid, Spain), Santo Niño de Praga (Holy Infant of Prague, Czecheslovakia), Santo Niño dela cruz (Holy Child of the Cross), Santo Niño delos inocentes (Holy Child of the Innocents), El Capitan General de Filipinas (The Captain General of the Philippines), Santo Niño Bailando (Dancing Holy Child), Santo Niño Jesus de Gracia (Holy Child Jesus of Grace), Santo Niño han Tacloban (Holy Child of Tacloban), Santo Niño del Evangelio (Divine Child of the Gospel), Santo Niño del Danto Rosario (Holy Child of the Holy Rosary), Santo Niño de Atocha, España y Mexico – Painting (Holy Infant of Atocha, Spain and Mexico), Santo Niño dela Victoria (Holy Child of Victory), Sancto Bambino dell Ara Coeli (Holy Child of Ara Coeli, Rome, Italy), Santo Niño de Cebu de Bronce (Holy Child of Cebu in Bronze), Santo Niño de Cebu en Marfil (Holy Child of Cebu in Ivory), Santo Niño ng Pandacan (Holy Child of Pandacan), The Sleeping Santo Niño de Cebu, Santo Niño dela Santa Iglesia (Holy Child of the Church), Santo Niño de los Obreros (Holy Child of the Workers), Santo Niñodel Cielo (Holy Child of the Heavens), Santo Niño del Consuelo (Holy Child of Consolacion), Santo Niño de Familia Fernan (Holy Child of the Fernan Family), Santo Niño de Tenate (Holy Child of Ternate), Santo Niño dela Paloma (Holy Child of the Dove), Santo Niño de Huida (Holy Child in Flight), Santo Niño de Almohadon (Holy Child of the Cushion), Santo Niño del Sagrado Corazon (Holy Child of the Sacred Heart), Manuelito de Peru (Little Emmanuel of Peru), Santo Niño El ray (Holy Child the King), Santo Niño delas Flores (Holy Child of the Flowers), Santo Niño de Tondo (Holy Child of Tondo, Manila), Santo Niño de Santa Eucaristia (Holy Child of the Holy Eucharist), Santo Niño de la paz (Holy Child of Peace), Santo Niño de Pasion (Holy Child of the Passion), El Buen Pastor (The Good Sheperd), Santo Niño De Malolos (Holy Child of Malolos), Santo Niño Jesus de Cebu (Holy Child Jesus of Cebu). There is this area is located at the center of the exhibit forming a rectangle. 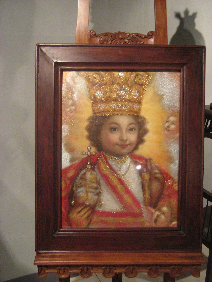 Santo Niño de belen (Holy Child of Bethlehem), Santo Niñog Mangigisda (Holy Child the Fisherman), Santo Niño Salvador el Mundo (Holy Child, Savior of the World), Santo Niño del Cebu del Siglo XVIII (Holy Child of Cebu of the 18th Century), Santo Niño de Ramos (Holy Child of the Palms), Santo Niño Durmiente (Sleeping Holy Child), Santo Niño del Mar (Holy Child of the Sea), Santo Niño de Abundancia (Holy Child of Abundance), Santo Niño de Mindanao (Holy Child of Minadanao), Santo Niño de Zurdo (Left Handed Holy Child), Santo Niño de Ilocandia (Holy Child of the Ilocos Region), Santo Niño Vagabundo (Holy Child Vagabond). I wanted to put all the pictures I have taken but there are just too many to put here (About 36-40 images - blogger's got a limit for pic sizes), so you better see it for yourself in order for you to appreciate it more! Enjoy!